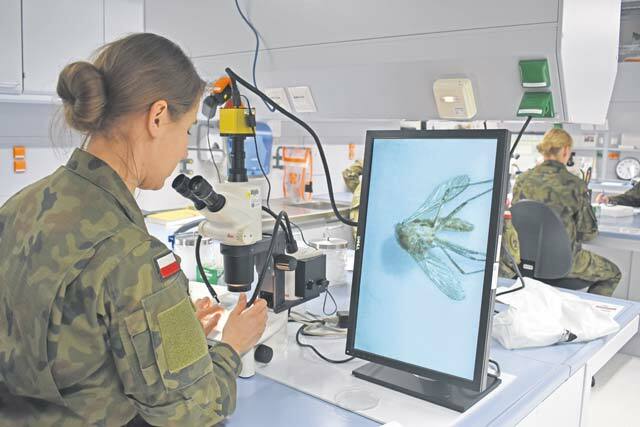 An officer of the Polish Epidemiological Response Center team examines a mosquito under the microscope. 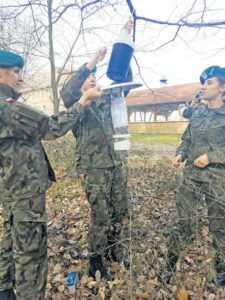 Public Health Command Europe’s Entomological Science Program invited the Polish Armed Forces for a joint mosquito surveillance training at the PHCE Headquarters March 6 to 7. Five Polish officers from the Epidemiological Response Centre attended the training which covered mosquito biology and military history; medically important mosquitoes of Poland; trapping types and techniques; and developing a vector disease response plan. Not only did the ERC exchange knowledge and expertise within the entomology service but also the preventive medicine services. 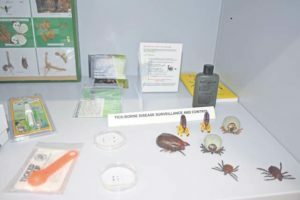 Tick-borne disease surveillance and control items. The cooperation with the ERC of the Polish Armed Forces started last year while preparing for a tick surveillance mission in preparation for Saber Strike 2018, a U.S. Army Europe-led cooperative training event that is designed to enhance readiness and interoperability with allies and regional partners. During the exercise, PHCE’s Entomological Science Program discussed the possibility of collaboration and assisting the ERC with setting up the first ever Polish military run mosquito surveillance program, which led to the development of this training event. The ERC of the Polish Armed Forces is a specialized unit responsible for biological threat countermeasures and medical intelligence. It is part of the Military Medical Service Division under the Inspectorate of Branches of the Polish Armed Forces. The ERC comprises mobile and stationary elements, to include a mobile laboratory to conduct expeditionary field confirmation of biological threats. Polish officers set up a tick trap as part of their training. This collaboration builds PHCE’s interoperability with NATO allies and opens doors to future partnerships. Moving forward, PHCE will continue to foster their relationship with their Polish counterparts and other allies and partners. Later this year, PHCE representatives will attend an international scientific conference where they will be able to share and expand knowledge on epidemiology between the Polish, Slovakian, Czech and American uniformed services.